Magnetism can be passed from magnets to other magnetic materials so they become magnets too. Here is a way to magnetise two needles. You can use these needle-magnets for other experiments in this site. 1. Hold a needle by the eye and stroke it gently 30 times with your magnet, in the same direction. 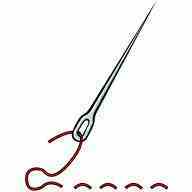 Do the same with the second needle, making sure that you use the same end of the magnet. 2. Test your needle-magnets on some pins before you use them for other experiments.